Record crystal-clear sound and significantly reduce autofocus noise on your compatible Nikon camera using this compact stereo microphone. 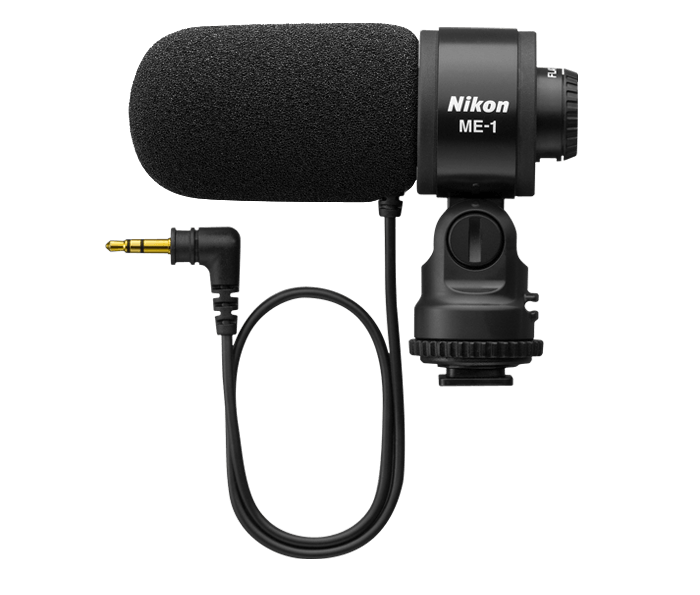 The ME-1 Stereo Microphone connects to compatible cameras that have a 3.5mm Mic jack and features new innovation that significantly reduces autofocus noise from being recorded. Designed for use with a compatible Nikon camera featuring a 3.5 mm (diameter) stereo mini-pin jack. Equipped with a cable stop which holds the cable in place to prevent noise from being recorded with accidental contact with the cable. The AS-N1000 Multi Accessory Port Adapter must be used to attach the ME-1 Stereo Microphone to the Nikon 1 V1 camera body. Reduces vibration noise during autofocus. Low-cut filter reduces wind noise and other low-frequency noise not blocked by the wind screen.